If it’s a sweet treat you crave but don’t want to indulge in chocolate or something ooey gooey then this recipe is a must try. Christmas prep is in full swing at my house and the hustle and bustle in the kitchen only means that I’m baking up a long list of holiday favourites for everyone to enjoy. I like to be ahead of the game and get some treats and breads ready in case of unexpected guests or even just as a sweet treat on a cold winter’s day! With so many rich, traditional foods at Christmas, it can be a welcome change to be offered a slice of delicious home-made Stollen bread with butter, cheese, or a homemade preserve such as my carrot marmalade which I also use in this recipe. With the coming and goings of expected and unexpected guests during the Christmas holidays it’s a good idea to have a stand-by recipe for bread suitable for all occasions. This Stollen bread recipe offers just that and it’s not that difficult to make but it’s the culture behind the bread that most people often wonder about. I tend to make Stollen cake weeks in advance so the flavours have time to come together and when defrosted the cake becomes very moist although it’s simply divine eating it after it’s cooled and come from the oven. We are so used to the tried and true holiday recipes that it’s nice to try something different so that your guests get to experience something that they can talk about after they leave your house and possibly want to make themselves for their family or co-workers. If you have leftover Stollen bread you can do what I do and make bread pudding using the same recipe that I use for my Italian Panettone bread pudding recipe. Panettone is the Italian version of a Christmas bread but it’s much lighter in texture compared to the Stollen bread. Stollen also known as Weihnachtsstollen or Christstollen is a yeast bread some call it a cake because it is speckled with fruit and sprinkled with icing sugar. The bread is also sometimes filled with a marzipan surprise that most people won’t expect but is delicious. Stollen is a popular German and Austrian specialty that is traditionally served at Christmas time. Stollen can be served at any time may it be breakfast, coffee or tea time! If you have never tried Stollen it is slightly sweet and is even delicious toasted with butter although when it comes from the oven I brush the Stollen with melted butter and dust with icing sugar. Both Germany and Austria are renowned for their Christmas markets with the smells and tastes adding to the festive ambiance of the surroundings as everyone comes out to shop and eat. 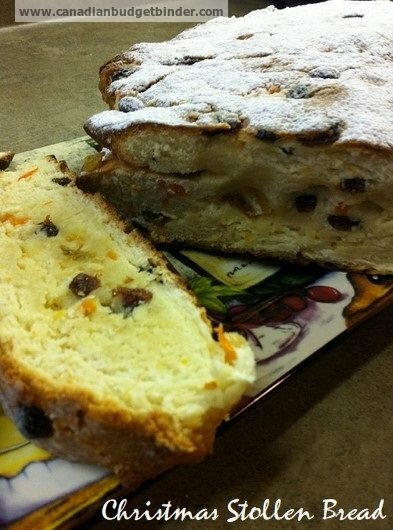 This Stollen sweet bread/fruit cake is widely sold at the markets some with marzipan including various fruits and nuts but it’s also made at home for those that don’t mind a little elbow grease and preparing baked items from scratch. Austria is also famous for its capital Vienna, their composers and it is also a place that I would love to visit. The deep history of folklore and music is something that I really want to experience and is definitely a stop on my bucket list. Until then I bring the tastes and traditions of Germany and Austria into our family kitchen with this lovely Stollen bread that never lasts long around our house and today for you in your kitchen. 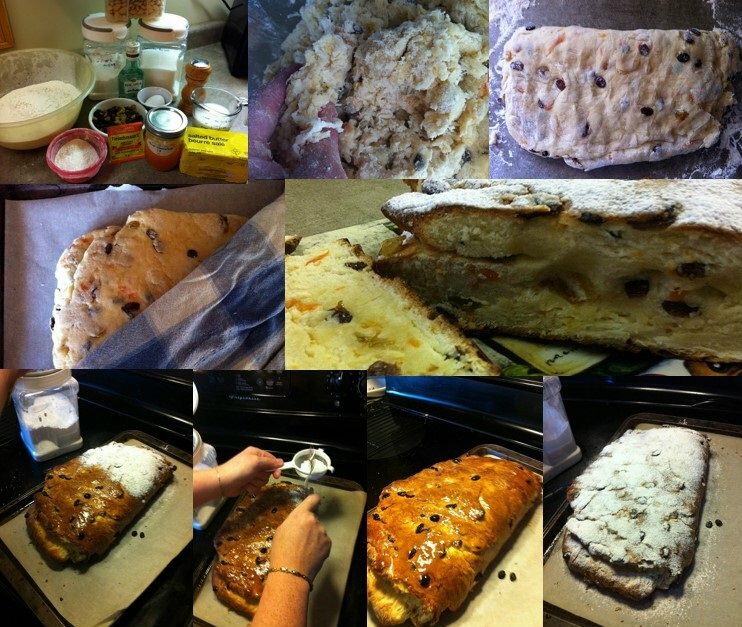 I hope you enjoy this simple Stollen recipe and share it with your family during this holiday season. If you are ready to learn how to make homemade bread put your apron on and let’s get baking. Mix together the warm milk, sugar and yeast and leave it in a warm place until it is frothy. Sift together the flour and salt, make a well in the centre and pour on the yeast mixture. Add the softened butter (if it's too hard put it in the micro for a couple of seconds) and egg and mix to form a soft dough. Then mix in the raisins, sultanas, peel or carrot and orange jam, almonds and sprinkle on the rum. Knead the dough on a lightly floured board until it is pliable. Place the dough in a greased bowl, (remember my tip on greasing bowls keep and use your butter wrappers) cover it with non-stick paper or plastic wrap and set it aside in a warm place for about 2 hours, until it has doubled in size. Turn out the dough onto a floured board and knead it lightly until it is smooth and elastic again. Shape the dough to a rectangle about 25 x 20cm or 10 x 8 in. Fold the dough over along one of the long sides and press the 2 layers together. This is a waiting game for the bread as it needs to rise but it sure is worth the end result. Now heat the oven to 200oC/400oF. Bake the loaf in the oven for 25-30 minutes, until it is well risen. Allow it to cool slightly on the baking sheet, and then brush it with melted butter. Sift the sugar over the top and transfer the loaf to a wire rack to cool. This bread will freeze well and keep for up to 2 months in the freezer and is great to give away as gifts at Christmas even if you decide to make mini Stollen treats. In our family we eat Stollen on Christmas morning before starting our festivities. Andrea very jealous. Its a very magical place at xmas. I’ve never tried to make it, but I miss it every year. They do sell it in stores here but it’s juts not the same made in regions in Europe. Nom! I’ve never tried to make this but I have heard about it and likely have a couple or three recipes in my books if I looked. The recipe does look yummy!!!! I usually have just Thompson raisins in the house and I doubt if anyone here would complain about using those. I can likely get one of those really small bottles of rum for it and let my SIL have the rest of the bottle in some eggnog if she comes here at Christmas…. 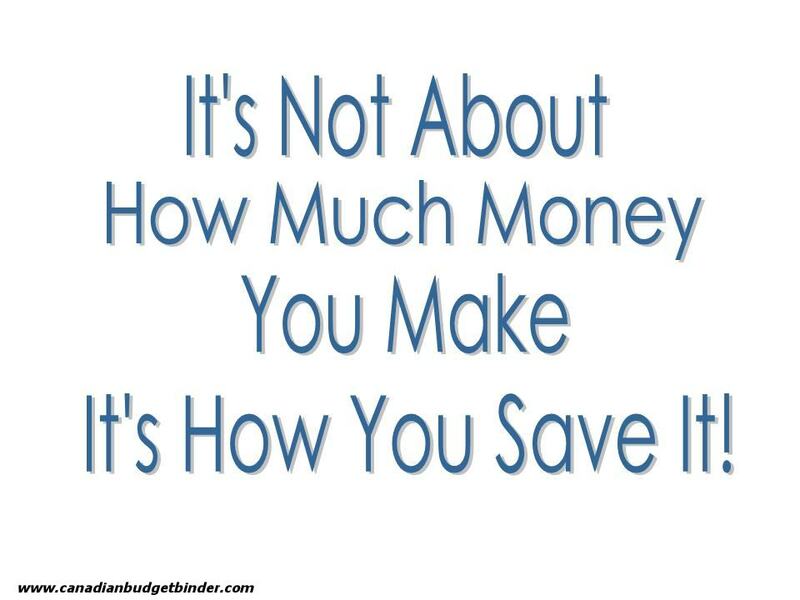 or just see if the younger lad has some upstairs I could use….. I can’t remember if he has some or not, he takes after his aunt and likes it in eggnog so it’s quite possible. Thanks for a lovely recipe Nicola!!!! Love stollen bread! I haven’t made this in years but I see it happening in my future soon! Great recipe! I grew up eating stollen and loving it. I didn’t know about the marzipan & always thought it was some mistake in the dough! Thank you for clearing that up! haha We always bought stollen in the bakery, but I might get ambitious and actually make it this year. Thank you so much for sharing the recipe!